- Finished the single player. Haven't tried multiplayer. - The game took 34 hrs. I subverted all main missions, did all cell tower and weapon dealer missions, and found all tapes except 1 and I can't remember which one I missed. I did quite a bit of diamond hunting in the north but not much in the south because by then I had bought pretty much everything I wanted. - This game is beautiful. I love the lighting, weather, sunsets, etc. It has an amazing sense of place. - They really nailed the combat. The weapons are very satisfying and feel and sound great. They AI is pretty good at taking cover and flanking. - PC version has save anywhere. Console versions have save points that you have to find like in safe houses. This annoyed me a bit at first but I got over it. - The amount of land to explore is massive with a nice variety of environments. - Side and even main story line missions follow a pretty rigid structure without much deviation. You'll find yourself doing the same types of missions over and over again with just a few slight variations and a change in locale. But it nails so many core aspects I don't mind the repetitive nature of these activities. It reminds me of Assassin's Creed in this respect. I didn't mind the repetition because I was still enjoying myself even after 30 hrs. - You will definitely want to subvert the main missions to get the upgrades to your safe houses. - I did all available weapon dealer missions first because I wanted to unlock my weapons first. - I love the vehicle with the mounted grenade launcher. You can burn down entire villages and checkpoints. - Fire looks cool and affects gameplay. It spreads like a real fire does. - Malaria isn't too bad. You only run low on pills once you advance a certain amount in the main missions. So you can work on side missions without ever worrying about running out of pills. - Weapon jamming is a bit more of an issue. Just make sure you go by the weapon dealer and swap out weapons every couple of missions. - There are many ways to approach an objective especially depending on your play style and weapon load out. I'm usually a mid range assault rifle kind of guy but I quickly fell in love with sniping. 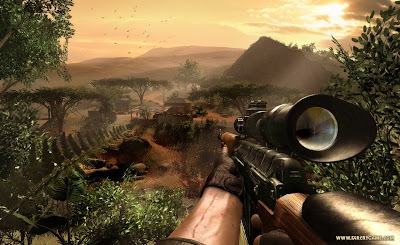 - It is by far one of the most satisfying sniping games out there. I pretty much only used the Dragunov and then switched to the AS50 as soon as I was able to unlock it. Things get way intense when they start shooting mortars at you. You are frantically trying to fend off guys that are charging and flanking you while still trying to find that damn mortar dude (which the AI has amazing accuracy with). - The ending was a bit short but overall a very satisfying game and a very long one especially for a shooter. The story was rather confusing. I really didn't care who was who or with what faction. Leadership seemed to change almost between every mission. Highly recommended. Looks great and plays great. If you dig the core elements of this game and don't mind a bit of reptition, you are in for a great experience.